Take a minute and journey with me into the muddy waters of licensing, royalty payment, and copyright. If you’ve had much experience with these things in the past, you quickly realize that the way that copyright holders in the United States get paid is a complicated mess. Unfortunately, this mess is one of the most important things for artists and musicians to understand. If you missed our series on understanding copyright, I recommend you take a few minutes and read them. These articles will help give you a good foundation to understand the rest of this article, and why Fair Play Fair Pay is important. What is Fair Play Fair Pay? One of the odd quirks of copyright law is that the performing artist does not get paid when their song is played on traditional radio. When a song is played on your favorite FM radio station, the station pays only the owner of the underlying musical work. This usually means that the publishing company gets paid, and then they pay the writers of the song. This is different from digital radio services like Pandora, Sirius XM, and Spotify, which are required to pay royalties to the artist and owner of the sound recording copyright, in addition to the owner of the underlying musical work. Currently, the United States is one of the only developed countries in the world that doesn’t also pay artists and sound recording owners when their music is played on traditional radio. But the Fair Play Fair Pay Act is trying to change that. If the Fair Play Fair Pay Act passes, the artists and labels who own the sound recording (SR) copyrights would be entitled to compensation from the radio stations that are benefiting from the public performance (each spin on radio is technically a performance) of those works. How Will Artists Get Paid? The royalties earned from radio airplay would be directly paid to SoundExchange, a non-profit organization that was set up by the government to collect royalties from digital radio services. SoundExchange automatically divides royalties between artists and the SR copyright owner. The primary artist on the track will receive 45% of royalties, labels and SR copyright owners 50%, and other featured musicians on the track will get 5%. The act will also specify a minimum payment amount based on how the radio station (internet, terrestrial, or streaming) uses those sound recordings, and whether or not the use is promotional. The royalty rate will be determined by the Copyright Royalty Board and not set into law by Congress, which is good news for artists since it’s much easier to renegotiate rates with the Copyright Royalty Board than with the Senate and House of Representatives. Direct, negotiated licenses will still be available, but payment for the use of the sound recording will still have to go through SoundExchange. This minimum payment is great news for artists. It means that a service like Spotify, or even Pandora, could possibly pay a higher rate because consumers are more involved in choosing the music they will listen to, unlike traditional radio where all the music is chosen for the listener. Though it seems like a small thing, the fact that America is one of the last developed countries to implement this kind of royalty payment for traditional radio is a really big deal. Because America’s royalty payouts don’t look like the rest of the world’s, the American music industry loses about 100 million dollars annually. Basically, if a radio station in the UK plays a song, they have to pay to play the underlying song, and pay the artist/label for paying the sound recording. If the artist is American, that money will come back across the pond. But it will only be the royalties for the underlying composition, because America doesn’t have a reciprocal (i.e. similar) right that says artists have to be paid. If Fair Play Fair Pay passes, those reciprocal rights would kick in, and American artists would be payed the same as their European counterparts. The act will also make sure that small broadcasters, like college stations, and public broadcasters, like NPR, will pay a reduced royalty rate so that the changes in the law won’t force them out of business. The bill also gives SR copyright owners an easy way to make sure the producers and sound engineers who worked on their project get paid. If this law is passed, it will keep internet radio stations like Pandora from trying to lessen their payments to artists. You can read about that fiasco here. 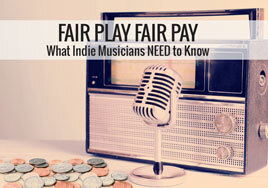 Why is Fair Play Fair Pay Important for Independent Musicians? Fair Play Fair Pay will mean more money in the hands of artists. And if you are an independent musician who owns both copyrights to your songs, when your songs are played on terrestrial radio, you will get 95% of that royalty rate, plus what you would already be making from the underlying copyright. This act is a step in the right direction for the major copyright overhaul that is desperately needed, and that musicians and other creators have been asking for since the early 2000s. Independent musicians are by far the largest force in the music industry. Our main problem is that we don’t know how to band together and use our powers for good! When legislature comes up before Congress that will positively affect musicians across the board, indie musicians should be the most excited. And in the case of a new law passing, musicians can actually do something by emailing their representative and senators, and getting involved with organizations like GRAMMY On The Hill, or the Future of Music Coalition, that are working to help get these bills turned into law. If you’d like to get involved, you can click here to write to your congressional representatives, or even tweet at them! Do you think the Fair Play Fair Pay Act should be passed? Do you think it will make a significant difference for artists? Let us know in the comments below! During a recording session for his hit song “Izzo (H.O.V.A. ),” Jay-Z was joined by a guest, Demme Ulloa. While she was visiting, Ms. Ulloa spontaneously created and began singing a countermelody to the song. Jay-Z heard the countermelody. Ms. Ulloa left the studio with an agreement that she would get credit if Jay-Z decided to use the countermelody, which he did decide to do. Jay-Z had created the song. Logically, he would be the sole owner. However, that countermelody throws a wrench in things. Had it not been used, Jay-Z would unquestionably be the author of the song. But it was used; furthermore, their agreement didn’t discuss ownership or authorship… just credit. After Ms. Ulloa discovered that Jay-Z had used her countermelody, she filed a lawsuit against Jay-Z and other defendants, claiming she was a co-author of the song. So, does Jay-Z now have to share ownership of the song with Ms. Ulloa? 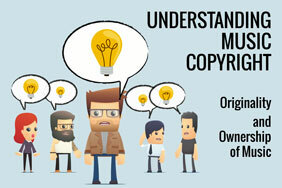 Let’s go back to our criteria for ownership: it must be copyrightable, so it must be original. Like a melody or rhythm in a composition, countermelodies generally can be copyrighted on their own, separate from the song’s other parts. Even though Ms. Ulloa’s countermelody was based on the original underlying melody, the court said it contained enough originality to be copyrightable. It was over these exceptions that Jay-Z, the other defendants, and Ms. Ulloa argued during the lawsuit. Let’s look a little closer at them. For joint ownership to be present, the individuals involved must intend to be co-authors of a song. This is more than simply working together; it’s the intent to be co-authors of a copyrightable work. In the Jay-Z case, Ms. Ulloa claimed that she was a joint author in “Izzo (H.O.V.A. )” because she added a countermelody. After Ms. Ulloa sang the countermelody for Jay-Z, they discussed the possibility of incorporating it into the work. However, she did not sign a contract or discuss any terms beyond receiving credit as the vocalist (if her countermelody was eventually used). The court decided that Ms. Ulloa’s claim for authorship had no basis because there was no evidence that Jay-Z intended to share the authorship of the track with her. Briefly working together was not enough to show the needed intent. Interestingly enough, you can be co-authors with someone you have not even met. While it may be easier to conclude a joint work has resulted if the authors have met in person or know each other, it is not a requirement. All that is required is the authors intend their work to be joined with the work of another. How does joint authorship work with people who haven’t met? Imagine a musician, John, composes some new music; John takes that music to a publisher to find someone else to add lyrics. The publisher buys John’s music and asks Lauren, who John does not know, to compose lyrics to accompany John’s music. Although John and Lauren had never met before, when their work is merged into one song, they become joint authors in the final composition. This is because both understood and intended their work be joined with another person’s work. US Copyright Law also molds an exception for employees hired to create songs for their employer, called “work made for hire.” Instead of staying with the author, the author’s employer owns the rights to the work. Generally, this occurs because the author signed a contract (containing a clause to that effect) before the song was created. Let’s say John is hired as a writer and composer of advertisement jingles at ABC, Inc. The copyright for the jingles John creates will likely not be John’s but will belong to ABC, Inc. This meets the work for hire criteria, specifically “work prepared within the scope of employment.” It is John’s job to create these jingles; it is why he was hired. While different, both derive from the same concept: you can give away your rights to a song before you even write it. So, if you try to claim it as your own, it is stealing your employer’s property. Now, there are exceptions to the “work for hire” concept. Let’s say that, while employed writing jingles for ABC, Inc., John wrote songs for an album. His employer would not own these songs unless the employee contract John signed gave ABC, Inc. rights to the songs in addition to the jingles. Now, back to the Jay-Z case. Jay-Z argued that Ms. Ulloa was an employee because she signed a tax form with his company. To Jay-Z and the other defendants, this was enough to make the countermelody company property. However, the court did not agree. Even though Ms. Ulloa was somewhat inexperienced and filled out a tax form, the court found that she independently possessed the skills necessary to produce an original work and had only filled out the tax form to contact the defendants. Now that you have some basic concepts, let’s go back to the scenario that started this article. As we discussed, the most important question is whether you and your band intended to be co-authors at the time you wrote the song. Chances are the court will find that you intended to be co-authors with your band members, especially if you have co-authored songs in the past. But what about your drummer’s friend who suggested you take the songs up tempo? More likely than not, your drummer’s friend is not going to be a co-author because his suggestion is not going to be considered “copyrightable.” Additionally, like Ms. Ulloa in the Jay-Z case, there is no evidence that you or your band intended to create the song with your drummer’s friend. Disclaimer:The above article is not legal advice; is it not intended to, nor can it, replace professional legal advice in any way. 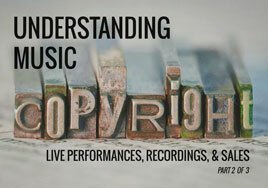 It is only intended to provide a short guide to basic legal terms and practices in the music industry. In your own interest, consult with a copyright attorney before entering into any contractual agreement or taking any action against copyright infringement. Over the past couple weeks, Source has shared three of my articles on music copyright. I know the articles were long, and I know there was a lot of detail in there. I also know how important it is to make sure your rights—and the rights of your fellow songwriters—are protected. CLICK the above image to open, download, or print! Note that, should copyright laws change, this chart may no longer be correct. Additionally, if you have questions regarding the legal intricacies of your specific situation, you should contact an entertainment attorney near you. I hope that this chart and the previous articles give you a good starting point to know your rights and the rights of your fellow songwriters! I know how important copyright is, and I know that it can also be completely confusing and overwhelming… so I’m breaking it down and going through it, bit by bit. This is the third article in the Copyright series. If you missed the first and/or second article, please take a moment to go back and read them before continuing this one. You know some of your fans are all over the streaming services, such as Pandora, Spotify, and XM radio. While you don’t want to put all of your music on there (since they won’t buy it if they can stream it for free or almost free), you are interested in offering two songs off of your newest album—one is an original, and one is a cover. But streaming is a bit more complicated than it seems, and you might have no idea what rights are involved with putting your music out there. The good news is I’ve done some digging for you. Streaming companies gain a license from musicians to play the recordings; the particular license depends on whether the streaming service is interactive or not. An interactive service—such as Spotify—allows the user to select the exact songs they listen to. In that case, the company would have to obtain the right to “digital performances of sound recordings” from the copyright owner. On the other hand, non-interactive services—like Pandora or XM Radio—provide a pre-programmed or semi-random combination of tracks; with these services, users cannot control exactly what song plays or when. These services need a “statutory license.” SoundExchange is a service authorized by Congress to administer statutory licenses. Additionally, streaming digital music is considered a public performance, so the services need to obtain performance rights to perform underlying musical composition. So, to stream music online, you will likely need to transfer the underlying performance rights in the musical composition and the right to the digital performances of your sound recording to the service providing the streaming. Unless you have given up some of your rights, you have the right to place your own music online or on the radio. If you have not already created a digital version of a song someone else created, you will need a mechanical license to create that sound recording in digital form and to stream that song. Again, most copyright owners use the Harry Fox Agency to manage this interactive streaming license. Additionally, you will need a public performance license for the musical composition, and you will need to pay the performance fees to the correct PROs. After acquiring the proper rights from the original song owner or publisher and creating your version, you will need to give the service the right to the digital performance of your sound recording. In an effort to promote your new album, you’ve taken the best songs—the one with the killer hook, and the crowd pleaser—and come up with crazy-awesome concepts for a music video. You’re ready to start production, but you want to make sure you cover all the bases first. When you create a music video of your original songs that is not being live streamed, your reproduction, distribution, and synchronization rights come into play. “Synchronization” is a special kind of right not precisely defined by law; that said, it is generally understood to be part of your reproduction rights and comes about anytime visual images are placed with your music. To get your music video online or on TV generally requires you license the company or service a portion of your rights. To start, this will include both some sound recording (because you are not performing live) and musical composition rights (because your music and lyrics are still being played). Since companies will want to cover all their bases, the contract you enter with the company will likely be over-inclusive for what is actually required. Often this will include the right to reproduce the video, distribute the video, display your band name or CD cover, perform (or “play”) your work for public viewing, and derivative rights, to prepare derivative works. You may be thinking, “what are derivative rights, and why do they need them?” Derivative rights allow the company to adapt or change the music video—usually to fit their programming and produce the show for viewing—without infringing your copyright. It is more common with television programs than online services. In terms of songs someone else created, you need two things to legally distribute your music video of a cover song: a mechanical license and a synchronization license. Why do you need two licenses? Your music video has an underlying audio track that exists as a separate file from the final video. That audio track technically requires a mechanical license (to create the recording and distribute it; the Harry Fox Agency handles mechanical licenses. But, in order to make a music video and align that recording of someone else’s song with any moving images, you need a special license called a “synchronization license.” This is obtained from the musical composition rights owner—likely the artist’s publisher. To find the publisher, you can look the song up on the PRO’s (BMI, ASCAP, or SESAC) website; find and contact the owner/publisher; and request to negotiate a synch license. One thing worth noting: since you can also obtain the mechanical right from the owner/publisher, you might be able to obtain a “sync license” that includes all the necessary reproduction and distribution rights you need for your video… meaning you wouldn’t need a separate mechanical license. What does this mean, practically speaking? That hit song that everyone and their brother is covering online—those artists either obtained the proper licenses (which can cost a pretty penny, depending on the song) or they did it illegally. And doing things illegally has a range of repercussions ranging from your account being penalized to legal action. Even if everyone else seems to be doing it the wrong way, is it really worth risking your reputation, your online presence, your finances, and your career? Your music videos’ view counts are climbing by the minute, and your new album is trending on social media and climbing the charts (congrats!). You’ve had two emails come in—one from a company wanting to use your cover of a song in a television ad, and one wanting to use your original song in a movie. Let’s start with your original song and the movie. The rights you might have to give up depend on whether the movie company is using a pre-recorded version of your song or is asking you to record a new version for the movie. If they want to use a previously recorded version of your song, they will have to obtain a synchronization license and the sound recording license (called a “mast use license”). The mast use license is acquired from whomever owns the rights to the sound recording–likely you or your record label. Anytime your music is placed with moving images, a sync license is required from you and/or your publisher. The sync license should cover your performance royalties from the showing of the movie; this means the producer will submit a “cue sheet” to your PRO and the authorized broadcasts will be granted only to companies registered with your PRO. The license might also include a mechanical license, since they will likely want to release, reproduce, and distribute a soundtrack with copies of your song… and you want to get paid for those copies! If you are recording a new version, you will likely have to give up sound recording rights, display rights, distribution rights to the work that results, the right to reproduce copies of that recording, as well as any derivative works resulting from that recording. Seems like a lot to give up, but it is pretty standard. This is important: if you have already recorded a version of your song with a record label, be sure you do not need their permission to use the previous recording or to record a new version of the song for this new use. Now, for licensing the cover song. Whether it’s a movie, a music video, or on television, anytime you want to place someone’s music with moving images, you need a synch license. If you already have a music video and obtained a synchronization license from the artist’s publisher, you might think you’re covered. Think again. Since this is a different use, the sync license will most likely need to be negotiated again. Additionally, performance rights to the underlying musical composition need to be obtained from the proper PRO and fees paid accordingly. Hopefully, the ad producers will take care of this for you! So far, we’ve covered the most common Copyright issues. Let me know if there are additional topics you’d like me to address by leaving a comment below… and be sure to check back and find out more! Disclaimer: The above article is not legal advice; is it not intended to, nor can it, replace professional legal advice in any way. It is only intended to provide a short guide to basic legal terms and practices in the music industry. In your own interest, consult with a copyright attorney before entering into any contractual agreement or taking any action against copyright infringement. This is the second article in the Copyright series. If you missed the first article, please take a moment to go back and read it before continuing this one. Let’s say you’ve got your first big gig coming up, and you need a set list to fill 90 minutes. You have a bunch of original content, but you also know that the cover song can really bring in a new crowd. There are a few songs you have in mind, but you’re worried about copyrights. How do you protect your songs, and how do you avoid trouble for doing cover songs? If you have not given all of your public performance rights to someone else, you have the right to perform your own songs in public. However, because you are performing your songs in public, you should ensure that you have done everything you need to secure your rights to the song (such as filing with the copyright office). If someone is asking to perform one of your songs, you may be wondering if there is a benefit to granting another artist performance rights. In short, yes. The benefits include the royalties you receive for the use of your musical composition and, of course, exposure of your music to more potential fans. If you have signed some of your musical composition rights to a publishing company, the publisher may have a right to some of your royalties. If you want to perform a song someone else created, you will need a “public performance license.” There are two ways to obtain this license. First, you could go to the copyright owner. Likely, the artist’s publishing company administers the licensing for the song, so you will need to find out who the publisher is and contact them to obtain performance rights. Contracts for performance rights negotiated directly with the publisher can vary in a number of ways, but it will be a non-exclusive right (meaning you do not own the song) and, unless agreed to otherwise, you will need to negotiate this right for every song and every performance. The second, and easier, way is for the venue to go through a Performance Rights Organization (PRO). PROs work with restaurants, concert halls, nightclubs, hotels, and other venues to grant performance licenses. There are three main PROs that copyright owners use to track and issue licenses for performance rights: Broadcast Music, Inc. (BMI); the American Society of Composers Authors (ASCAP); and Society of European Stage Authors and Composers (SESAC). Nearly 100% of recorded artists are registered with one of these organizations. Venues typically (but not always) receive a non-exclusive “blanket license,” which will allow performing artists to use any of the PRO’s songs. It is likely that the venue you are performing at has already obtained the proper license from the PRO and is responsible for making sure the royalties are paid. So, look online for which PRO administers the performance rights to the song you want to cover, and ask your venue if they have the rights from that PRO. Lastly, and this is important: obtaining the rights to perform the music does not allow you to record your live performance of that song! Pumped, you start pulling together your best songs for a recording session. You’ve got eight or nine solid originals, but there are two cover songs you do that get the crowd up and dancing, every single time. You’d love to record those, too. Can you? As far as songs you’ve created, you have the right to sing, record, and distribute your songs freely (unless, of course, you have given your rights away). To record your song, you may have to give up some rights. Often, record label contracts will contain a clause that prevents you from recording other versions of your songs without the original label’s permission. The contract might also have you give up some or all of the sound recording rights to that final product. Read all contracts carefully, with a lawyer, before signing! 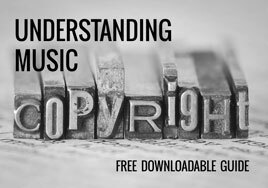 While you may need to give up some or all of your sound recording rights, you should still own the rights to the underlying music. If another artist wants to record your original songs, granting them recording rights can bring you exposure for your songs as well as royalties. To legally record your version of songs someone else created, you need to obtain reproduction rights from the copyright owner. Specifically, you need a “mechanical license,” which gives you the rights to reproduce and distribute others’ songs on your own album. You can obtain this license from the copyright owner through negotiations. Since it’s a complicated and time consuming process to track everyone who wants to use your songs, most copyright owners use the Harry Fox Agency to manage their mechanical licenses. This is a good place to start if you want to obtain a mechanical license. All copyright owners are given the rights to “first use” of their songs, meaning they get the opportunity to release the first public version of the song. After the song has been published, anyone can obtain a “compulsory license” by providing notice to the copyright owner and following a specific process. This allows you to still legally record the song, even if you’re having trouble obtaining a mechanical license from the creator or original artist. Please note that a mechanical license does not give you the right to post your version of the song on YouTube. We will get to this later. You’ve gotten your songs back from the recording studio—fully mastered and ready for release. You want to order physical albums to sell, since they have good profit margins and some of your fans like buying merch at shows (they’ve asked, repeatedly, if you have any CDs). You’re also interested in selling digital versions of the album and individual songs—including those cover songs. Manufacturing and selling songs you’ve created incorporates your reproduction (copying) and distribution (selling) rights in both sound recording and the underlying music and lyrics. If you use a record label, you may have to give away some or all of your sound recording rights. In doing so, you likely give them the right to distribute and reproduce copies. Also, by publishing your music to the public, others can now obtain a compulsory license to reproduce your music now. The benefit is of course the money you received in exchange for these rights. Now, let’s talk about legally manufacturing and selling songs someone else created. As discussed above, you need a mechanical license to create and sell your new songs without infringing the copyright of the songs you covered. 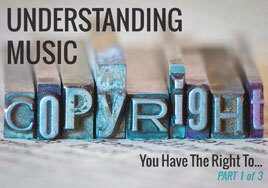 If you are working directly with the copyright owner, make sure you obtain the right to “distribute” the cover song; otherwise, you may have the right to use the musical composition in a new recording but cannot do anything with that recording. As discussed previously, the easier method of selling your cover songs is to obtain a “compulsory license” by providing notice to the copyright owner and following the specific process laid out in statutes. There is something else to consider: digital versus physical copies. These are two very different mediums, and the music industry rightfully makes a distinction. You can obtain the right to sell permanent copies in either medium by obtaining a mechanical license or a compulsory license, but having the right to one medium does not mean you have the right to the other. The Harry Fox Agency has two different forms; make sure you have obtained the right license! There’s one more thing worth noting on mechanical licenses: they are for a set number of specific sales (for example: 1,000 CDs, or 10,000 downloads) and will need to be renewed for additional copies. 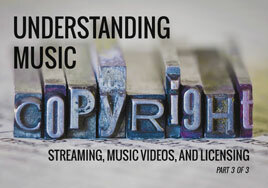 Next in the Copyright series: Streaming, Creating Music Videos, and Licensing Music. Be sure to check back and find out more! Now, a songwriter can retain all six of these rights for himself. Or, he can give them away (to publishers, record labels, manufacturers, distributors, other artists, and so on). The transfer of rights can be any combination of permanent and temporary, entire and partial. It’s worth noting that the six rights can be handled separately, and each right is infinitely divisible. Whether or not you, as a songwriter, choose to give away your rights—entirely or partially—is up to you. Know that giving away the wrong rights (or the right rights in the wrong way) can result in lost income . . . but so can clinging to all of your rights at all times. We’ll get to that in more detail later. Lastly, I mentioned that composition and recordings are protected separately. Here’s the reason: not all six of the above rights apply to sound recordings, but all six do apply, at one point or another, to musical composition. The rights that come into play depend on how the music is being used. Over the next few articles, we’ll look at how your rights come into play in a few scenarios: Live Performances, Recording, Selling Copies, Streaming, Creating Music Videos, and Licensing Music. Be sure to check back and find out more!